Sun., Sept. 24, 2017, 7 p.m.
Info: By Oct. 4, Cleone’s Closet plans to start food distributions three times a week, from noon to 3 p.m. on Monday, Wednesday and Friday. It also offers a rentable community space for activities and meetings. Also: This Saturday, Women’s Healing and Empowerment Network will host a Being There Conference, 9 a.m. to 5 p.m. at Hillyard Baptist Church, 2121 E. Wabash Ave. in Spokane. The session is titled “Healing, Recovery and Empowerment from Narcissistic Relationships and Spiritual Abuse,” and will offer a forum encouraging open discussion toward an abuse-free community. For information, go to http://whenetwork.com/. Healing from abuse is a lifelong process. Mable C. Dunbar knows about that personally. She grew up experiencing some physical and emotional abuse. However, Dunbar said she experienced God’s healing and that inspired her to help others. Dunbar is founder and CEO of Women’s Healing and Empowerment Network, which began in 2008 offering programs to address domestic violence and sexual abuse in faith organizations. For nearly a decade Dunbar has served as director of Frieda’s Healing Center, a 4,100-square-foot shelter in a confidential Spokane County location for women and children who can stay up to six months with counseling support. The shelter can house five to six families, and people who stay are from across the U.S., Dunbar said. Dunbar’s outreach doesn’t stop there. She is helping to reopen an Airway Heights community food bank, Cleone’s Closet Food Pantry, with plans by Oct. 4 to offer distributions three times a week in partnership with Second Harvest food bank and other community members. Named after a woman who was abused, Cleone’s Closet, at 13114 W. Sunset Highway, also will have limited clothing and household supplies for people in need, including women fleeing abuse, Dunbar said. 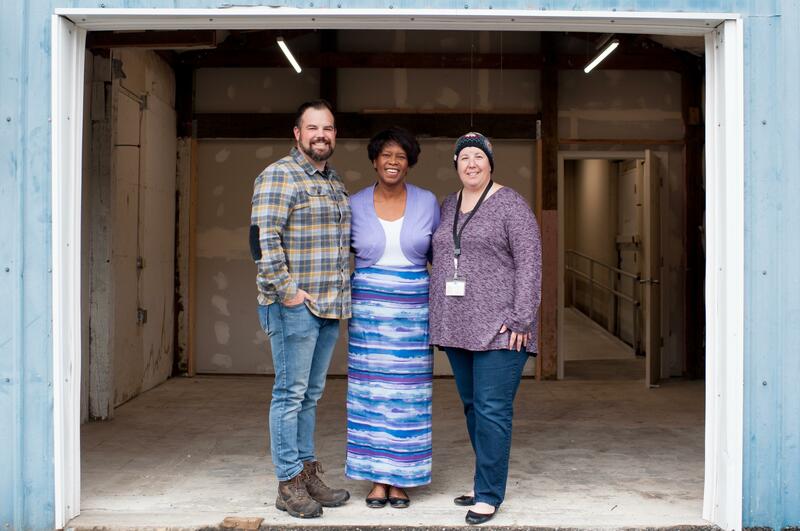 She and nonprofit members first opened a Cleone’s Closet three years ago with food distribution and a thrift store, but it closed more than a year ago when the building they leased was sold. Dunbar considered closing Cleone’s permanently, but then people in the community urged its return, she said. Jacob Powers, pastor of the Heights Church in Airway Heights, offered to help secure donations. He found someone who purchased a dedicated space for Dunbar to reopen a food closet and community center. A Baptist church in Airway Heights is the only other entity offering food bank distributions twice a month in the city, Dunbar said. Cleone’s also will rent a front-room space for community events and classes. Spokane Regional Health Department has a contract to use it regularly for parent-child educational activities, and other organizations can rent it for $20 an hour, she said. Powers said he invited people to meetings to discuss how to continue Cleone’s outreach. The city of Airway Heights is considered to be a high-level “food desert,” a phrase describing when residents of an area have limited access to fresh fruit, vegetables and other whole foods because of affordability, availability, distance or limited shopping options. He said other partners for Cleone’s includes owners of the Grocery Outlet in Airway Heights and the city’s Kiwanis group. City and school district leaders attended meetings to reactivate the center. “A lot of people in our community are excited to see this happening,” especially with the need for access to food, he said. Dunbar, who is wife of pastor Colin Dunbar, came to Spokane 17 years ago when they began work at West Central Multi-Cultural Seventh-day Adventist Church. She’s also a certified cognitive behavioral therapist and domestic violence counselor with a Ph.D. specializing in family mediation. She began working with abuse victims here after doing similar work in Michigan. Dunbar travels internationally to conduct workshops and conferences to educate communities, church leaders and members on the dynamics of domestic violence and sexual abuse. WHEN also offers a support group for men. Women sometimes stay in abusive relationships because of false religious beliefs, Dunbar said. WHEN’s counseling and resources are offered regardless of denomination or belief in God, but they have a Christian-based focus. Dunbar also directs a shelter for abused women outside of Airway Heights and consults with religious and secular groups for abuse prevention. “I’ve helped a lot of Christian women deal with domestic violence and abuse,” Dunbar said. “Because of religion, because of a message from some leaders, a lot of it is perpetuated – it could be pastors, their husbands or other church members – who sort of encourage a woman or man, because men are abused too, to stay in abusive relationships. Her experience with domestic violence dates back to her childhood. “My mother was raped, and she gave birth to me nine months later,” Dunbar said. “She was raped by someone who was a leader in a church. She was 18 years old. Published: Sept. 24, 2017, 7 p.m.